Thing is, in Pasadena, is that it’s nice there. But you don’t always want to hang out in “nice” all the time, you know? Okay. Or maybe you do. Take Magnolia, for example. It’s nice. There are some vamp-goth tendencies in the decor of this South Lake Drive Pasadena “hotspot,” and it seems to be working out for them. The bustling business on a Saturday night was a clear indicator to me of the locals’ admiration of Magnolia’s honest efforts at “cool.” And it was cool–they weren’t in Old Town [Pasadena] anymore, people. They were moving up in the world. They were certainly the coolest 40-year-olds in all of Los Angeles. As the waitress cleared out the table in front of us, she noted to two guys next to us who were standing nearby, “The couch is open, if you would like to sit down.” That was nice, because the place was crowding since it was after 10 and she thought it considerate to point that out. She smiled politely in response. I smiled at the usage of the old adage I remember most frequently used in college–that is, calling something or someone “gay”–as synonymous with “unsightly,” “stupid,” or even: “homosexual when we’re so not.” And then I knew–I really knew–that I was in the hottest, hippest spot in Pasadena. Later that night as we attempted to meet up a friend and his girlfriend in from out-of-town, we get turned down by Edison’s in Downtown LA, who has newly “reinstated” their dress code. I have this thing with dress codes. Perhaps I should disclose, first, that while my boyfriend wears Chuck Taylors that faithfully fail the “no sneakers allowed” provision of a typical dress code, I tend to regard dress codes as a way for clubs to make it easier for chauncey prepsters to masquerade as actual people who possess style, wit, class, or any combination of the above–otherwise defined as “cool.” Of course, dress codes are meant to “save” the business establishment from any sort of riffraff floating in from its nearby cardboard box–that or have a reason to impart upon its patrons that they are simply not “cool” enough by the bouncer’s lofty standards–but I mean seriously? Who are you? Are you telling me that the money of the tool ahead of me in line is better than my money because he is wearing loafers? ?Â Or that this loser Santa Monica wine bar groupie is better than me because he’s wearing a collared shirt under a pink sweater?? After my failing to convince the bouncer to let us in on this first exception “since we will now know to dress appropriately in all our subsequent, bi-weekly visits in which we will each rack up a $100 bar tab each,” roycifer’s friend directed us to what was thought to be a cool spot just a few blocks away. I guess it remains to be seen what my final review is on Edison’s, in the occasion I end up being actually admitted to the bar-club-lounge, thanks to the bouncer’s approval of my party’s outfits. 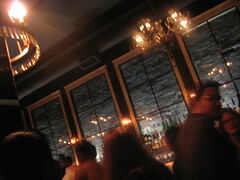 And so we discovered The Golden Gopher at 8th and Olive. Ironically, I discovered the same partner who started Edison’s had also done The Golden Gopher. Meh. Much better. 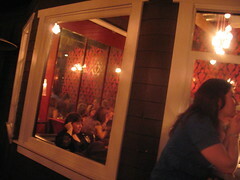 It felt like a neighborhood bar with say, a Silver Lake-Hollywood vibe, but instead it was located Downtown. A gem. A dive bar diamond in the rough. 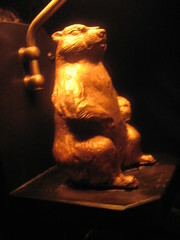 The final touch at The Golden Gopher? It was the Liquor-To-Go window by the entrance, where in the display case they had different bottles of whiskey and packages of condoms and cigarettes. In the end, what could have been a bust of a bar-hopping Saturday night actually turned out okay, thanks to The Golden Gopher. We’ll be back. This entry was posted in Downtown LA, Pasadena. Bookmark the permalink.